Sunday’s prompt for Haiku Heights’ September challenge is the word ‘Frog’. My mind works in mysterious ways and the prompt instantly took me back to 2004 when I travelled with a group of friends from Global Footsteps, to take part in a conference in Torun, which is in Poland. I’ve written about it before but I think it is worth revisiting. 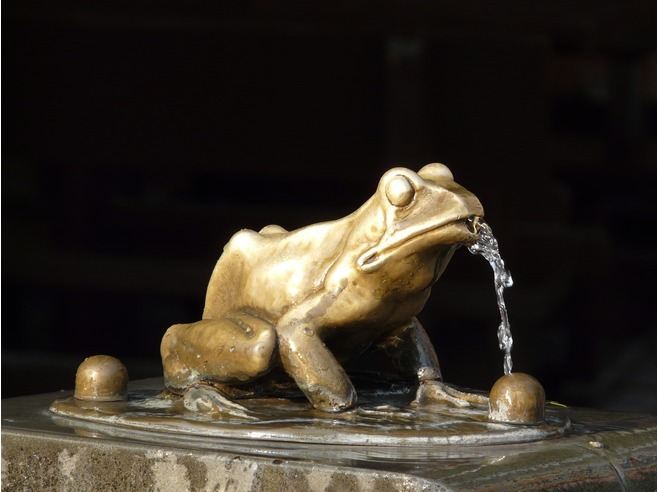 There is a wonderful fountain in the centre of Torun with several statues of frogs in it. It is called the Flisakiem fountain. Flisak was a raftsman in Torun who played the violin very well. According to an old legend, the city of Torun was overrun by a plague of frogs and no-one knew how to get rid of them. The Mayor promised the hand of his daughter in marriage to any person who could clear the city of the frogs. Of course, rather like the Pied Piper of Hamelin, Flisak played so well that all the frogs followed him and left the city of Torun. He claimed his reward and married his beloved and they lived happily ever after. It was on a chilly June morning in London that we caught the ‘Orbis’ coach for the 36 hour journey to Torun. The bus was not full so there was plenty of room and it was very comfortable. The friendly hostess, Isabella, served tea and coffee and we had a pleasant journey to Dover where we caught the Ferry to Calais. The weather was very pleasant and we had an enjoyable crossing. The channel was unusually busy because it was the 60th Anniversary of the D Day Landings. Old soldiers were gathering for a memorial service. We got back onto the coach and set off northwards through France, Belgium, Netherlands and Germany, crossing the River Oder at the Polish border town of Slubice. We were expecting long delays at the border but were astonished to be met by smiling customs officers who briefly checked our passports and waved us through with no problems. This is a very encouraging development since Poland joined the European Union this year. Already the scenery was fascinating to me and the weather was beautiful. I noticed the narrow cobbled roads in the towns, the many shrines by the roadside in the country and lots of churches. There was an abundance of pine tree forests and masses of poppies on the verges. I was thrilled to spot a stag and a hare and then amazed to see storks in the fields and a flock of herons. We were travelling on Route 22 towards the city of Gdansk. We saw flats along the way that reminded me of Russia, and a huge river with men fishing. Petrol stations were Statoil and fuel was 4.0 zl, about 60p, I guessed for a litre. We saw agriculture everywhere – endless fields of crops with no fences; allotments with dachas like grand sheds; orchards; lakes and picnic spots; and miles of greenhouses and garden centres. We saw timber-framed houses and lots of new buildings, but we saw very little livestock. In Belgium and Germany we had seen herds of very healthy looking cattle but none at all yet in Poland. We saw big churches with round towers, Rapunzel-style, and the remains of old city walls were evident in many towns. At Bydgostcz we stopped for coffee and met a Polish-Canadian-Scot who reminisced about D-Day, when he was 15 years old. He told us how he had been taken away from his village in Poland by the German occupying forces. They had forced him to fight for them. He was saved by the US troops who eventually offered to take him to the USA to start a new life. He had opted for Canada and eventually married a Scottish lady and went back with her to Scotland. He has now retired to Vancouver Island in Canada but visits Poland as often as he can. 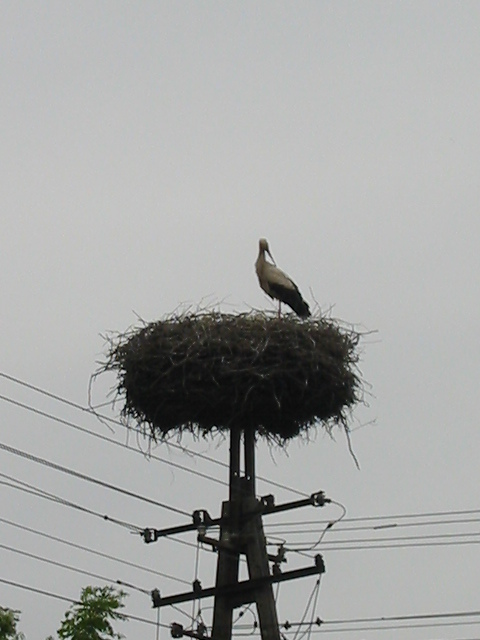 On entering Torun we saw storks on huge nests on top of telegraph poles. When the coach stopped a friend was there to meet us. He took us to the TTCA building to rest and unpack before we met our group leader who treated us to a meal at Damroki restaurant. The food was delicious and we were entertained by an impromptu folk concert performed by groups from all over Eastern Europe, who had attended the Folk Festival in Torun earlier in the day. On Monday, Ula (or Ursula), who is a professional guide, met us at the TTCA. Thankfully she speaks English very well, self-taught we later found out. She is going to give us a 5-hour tour of Torun. She was a mine of information and she showed us everything of interest in the old and new town. We walked miles until we were ready to mutiny so she took us to her favourite coffee shop. This was wonderful so all was forgiven. We drank a special coffee like Cappuccino with Pierniki sprinkled on top. Pierniki is gingerbread, which is the local speciality. Later Ula took us to a restaurant, which served pancakes and dumplings with exquisite fillings and lashings of strawberries and cream on top. We were a little puzzled, as they seemed to put savoury and sweet fillings all together and the portions were way too big, however it was very enjoyable. After our marathon walking tour we went back for a well-earned rest and shower before dinner. We were amazed at the low prices of meals in Torun. It varies of course but it was possible to get a very good meal and a drink for less than £2. Coffee and delicious pastries with fruit and cream cost less than £1.40. Kodak films for my camera (pre-digital cameras! ), which cost £4 in the UK cost £1 here and a loaf of freshly baked bread from the bakers cost about 23p. We just cannot imagine how the shopkeepers manage to sell their goods at these prices and still make a profit. We are worried that the cost of living may rise dramatically now that Poland has joined the EU. Public transport is very reasonable here and accommodation is good. Rents seem very cheap at £75 a month for a 1 bed roomed, central flat. Big US hotel chains are moving in with high priced rooms but there are still bargains to be had for the traveller or tourist. We stayed at the Twin Town Association building, which is in the restored Burgher House and Tower of the ruined Teutonic Castle. The large rooms have been refurbished to a very high standard and we shared bathrooms and a kitchen as in a Youth Hostel in UK. It was comfortable and cheap and, with fabulous views of the River Vistula from our windows it suited us very well. On Tuesday our guide met us at 8 am and rushed us off to catch the bus to the railway station where we caught a train for the 90-minute journey to Gniezno. The city is known as the cradle of the Polish state as it was in the Cathedral here that the first King of Poland, Boleslaw Chrobry, was crowned in 1025. We rushed to the Cathedral of the Assumption of the Blessed Virgin Mary and St Adalbert, founded 1000 years ago by King Boleslaw the Brave. Here we saw the famous bronze doors from 1175, which show 18 scenes from the life of St Adalbert. We also saw the statue of Our Lady of Gniezno and the sarcophagus of St Adalbert. St Adalbert was a Bohemian Bishop from Prague who passed through Gniezno in 997 on a missionary trip to convert the Prussians, a heathen Baltic tribe who lived in N E Poland. Sadly they didn’t want to be converted so they chopped his head off. King Boleslaw paid a ransom of his weight in gold for the body then brought it back to Gniezno and buried it in the Cathedral in 999. Pope Sylvester then canonised the martyr. After this very short visit we rushed off to catch a narrow gauge train to Biskupin. This trip was organised as a treat and was a major highlight of the trip for me. Gorgeous weather and fabulous countryside edged with poppies, and white and purple wildflowers. Biskupin was besieged by children on school trips but was very interesting. It was a sort of Baltic Blists Hill, with characters in costume minting coins, chopping wood, firing crossbows and riding horses etc. The ‘iron age’ fortified town was built entirely of wood some 2730 years ago on the shore of a beautiful lake. It was subsequently disappeared under a peat bog where it was perfectly preserved until 1933 when it was discovered by accident. It is now a fascinating archaeological reserve and one time film set. Wednesday was another gorgeous day arranged for us by a local friend, Anya. We started with a bus ride to the bike shop where we hired bikes. It took an age to organise this because the shop appeared to only have huge mountain bikes, which were fine for the men but not for we 3 delicate and very fussy ladies! We ended up a very motley selection with one on an ancient ‘sit up and beg’ shopper complete with basket, dodgy gears and a mudguard, another on a man’s bike with sticky red handles, and me on a junior BMX! After lots of giggles and false starts we set off for a 23 km round trip to Anya’s home for a barbecue. We cycled through the forest and past vast poppy fields and a bog seething with very vocal frogs. When we reached Anya’s home village of Lysomice we saw stork families on top of telegraph poles. Then we were treated to a super barbecue and lots of homemade blackcurrant drinks, some alcoholic and some not! We also met Killer the guard dog, who eats cucumbers, and had a guided tour of garden and greenhouses where Anya’s family grow tomatoes, cucumbers, fir trees and flowers to sell at the local Farmers’ Markets. The whole day was absolutely wonderful and we really enjoyed the cycle ride home to Torun. I was very proud of myself since I hadn’t been on a bicycle for 25 years! Thursday saw the Feast of Corpus Christe and being a Catholic country, the celebrations were massive so we had a free day in Torun. After the 9am Mass in the churches and 2 Cathedrals, the entire congregation left to process through the streets to the square where decorated altars had been set up. There were columns of nuns, altar servers, guides, scouts, priests, and rows of young girls in long white dresses and veils. They carried baskets of flower petals, which they scattered on the ground in front of the canopy covering the Priest and the Monstrance containing the sacred host. There was a military band leading the procession and a vehicle at the rear with loudspeakers amplifying traditional hymns. The processions came from all quarters to meet near Copernicus’ statue. There was a huge poster showing Pope John Paul 11 who visited Torun in 1999. A service was held here before the whole procession moved on to another square for another service. The crowd was huge and everyone was dressed in their ‘Sunday Best’. The windows and balconies of many houses and businesses were hung with posters, tapestries, candles, statues and mini shrines to celebrate the Feast Day. The Priests and altar servers wore white cassocks with embroidered or lacework chalice and host decorations. It was a grand occasion and a privilege to watch. It reminded me of May processions in the North of England when I was a child. In the evening we visited the Fort and saw a huge fire on the horizon. We never did find out what building was on fire. On Friday we had a very early start again for the 7.45am bus to the railway station to catch the train to Malbork. The journey took just 2 hours so we arrived in time for a lovely cup of coffee in the shopping centre. Sadly when we came out the heavens had opened so we had to buy umbrellas. The rain was torrential but nevertheless we set off for Mary’s castle. This is reputed to be Europe’s largest Gothic castle and Poland’s oldest castle. It is so important that in 1997 it was included in UNESCO’s World Heritage List. It is situated on the Nogat River, an eastern arm of the Vistula River, which flows through Torun. It is a truly impressive and huge reconstruction. The castle was built in three parts (higher, middle and lower castle) by the Teutonic Knights, who called it Marienburg (Mary’s Fortress). The Teutonic Knights, a German order, were also called Knights of the Cross. Their commander in chief was called a Grand Master. They were crusaders who wore white robes with a black cross. The castle was started in 1276 and finished within 30 years. The Knights ruled from here for 150 years. It was the largest fortress in the middle ages, but the castle, like Poland, had a very stormy history being in the hands of various conquering armies then largely destroyed in World War Two. It is now in danger from subsidence. Inside the castle there are several notable exhibitions. There is a room full of tapestries and a room full of exquisite jewellery boxes, altars, crucifixes, artwork and jewellery all made purely from amber. There is also a bombed out church which has not been renovated due to lack of funds. This is breathtakingly poignant with its battered walls and statues, and the miraculously undamaged boss of the Mother and Child. The memory of the broken crucifix will stay with me always. This empty shell of a church was the most moving thing I saw in Poland and for me it illustrates the total pointlessness of war. Saturday was a very special day and we had to get up very early for a bus and train journey to Gdansk. The area was referred to a Gyddanyzc (Gdaniesk) or wetness in 999 in “The Life of St Adalbert”. There was a settlement here as early as 2500BC and by the 13th century when the Teutonic Knights seized the city it was a major port and municipal centre. In 1454 the city broke free from the Knights and became a part of Poland. Over the next century there was incredible economic development in the city, which had a monopoly of trade in Polish grain. The city also became the largest town in Poland and a great centre for shipbuilding. 1580 to 1650 was a ‘Golden Age’ when artists and craftsmen settled here and the city became a centre of artistic and cultural style. In 1793 during the second partition of Poland the city was annexed to the Prussian state and underwent a long period of Germanisation, briefly interrupted by a period of French rule in 1807 to 1814. After 1850 there was another economic boom due mainly to the railways, the port and shipbuilding. In 1920 after WW1 due to the influence of the Britain the free city of Gdansk was created under the patronage of the League of Nations. However it then fell to the Germans in WW2 during which the Polish citizens of Gdansk were exterminated in concentration camps. Allied forces carried out air raids then the Soviet Russian troops almost destroyed the city and ruined its industrial base. After WW2 the Germans were expelled and thousands of new inhabitants set about rebuilding the city. I think they did a wonderful job as the city is incredibly beautiful. Peace did not last long though, because between 1970 and 1980 workers’ protests turned violent and prompted great social and political changes in Poland. In 1997 the city ceremoniously celebrated the millennium of the visit of St Adalbert Slawnikowic, the Bishop of Prague who left Gdansk in 997 on a Christian mission to then still pagan Prussia. In 1992 and 1999 Pope John Paul 2 visited Gdansk. We explored as much as it was possible to see in a day. We saw the shops, the churches and cathedrals, the memorial to the fallen shipyard workers and then caught a tram to the beach and paddled in the Baltic. It was a wonderful day and Gdansk is a place that everyone should visit. It is a city with everything in my opinion. It has history, culture, spirituality, beautiful buildings, wonderful people and a golden sandy beach. What more could anyone want. This entry was posted in Education, Haiku, Natural World, Photography, Travelogue and tagged Poland, Torun. Bookmark the permalink. ← My 15 minutes of Fame! Hi there! I really liked what you have written about the towns of Torun and Gdansk. Yes, prices are cheaper there because salaries and wages are far lower than in countries such as Germany or the UK. Indeed, a lot of people have left to go to countries that have better potential but many do come back to their homeland. I was recently in a a little fishing village on the Polish Baltic Sea – Leba, and I was astounded by the recent development and money coming in. On more investigation, the locals told me that financial backing came from Polish people or family members who lived abroad! We have a lot of Polish shops and businesses in our area now. But then there has been a Polish community here since the war when they were interred here. Lots of them stayed and raised families here. But now it is a lifestyle choice ~ they come to earn money asd you say and to be honest we couldn’t manage without them.